I have recently returned from a wonderful trip to India. I had the opportunity to spend two weeks in Kolkata with Deakin University surveying museums and cultural heritage sites. My particular interest in Kolkata was observing the museums’ approaches to interpretation and education. The experience was really something else. The people that we met shared with us their successes, challenges and the issues facing museums in this region, some of which were unique to India and others that had universal reach. India’s museums have such vast collections of their cultural heritage and this is both to their advantage and their detriment. The large volume of cultural materials puts a strain on resources, especially for smaller museums. Even the smallest regional Indian museums have such a wealth of arts and archaeological artefacts – they are bursting at the seams. There are huge challenges in conserving and preserving these collections and determining what is most significant. Tags: cultural heritage, Deakin University, India, museum education | Permalink. 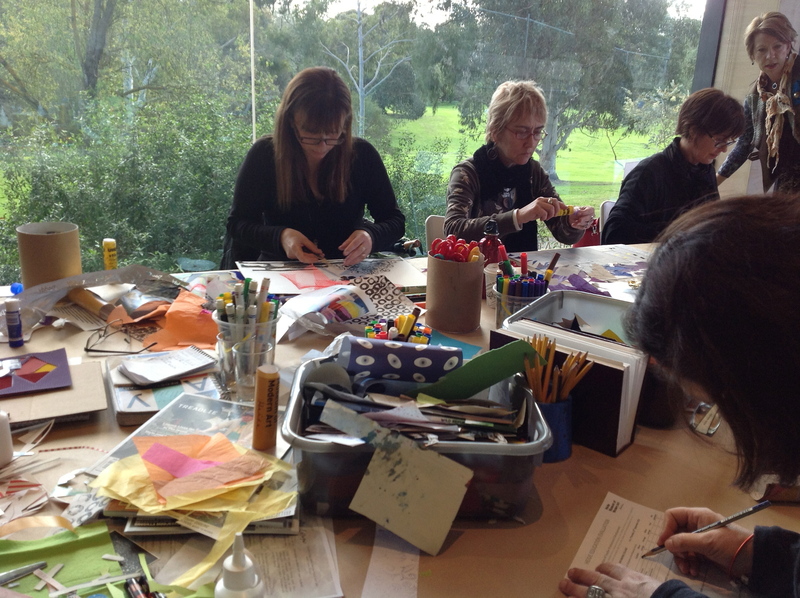 This week I was involved in a professional development day for educators at Heide Museum of Modern Art. The program was called Understanding Collage and our group of educators varied from ELC to adult education. After coffee and introductions in the Sidney Myer Education Centre (SMEC) we walked over to Heide I and were introduced to the exhibition ‘Collage: The Heide Collection’ by curator Lesley Harding. Lesley discussed some of the earlier works in the exhibition, including two collages by Sidney Nolan c 1939. 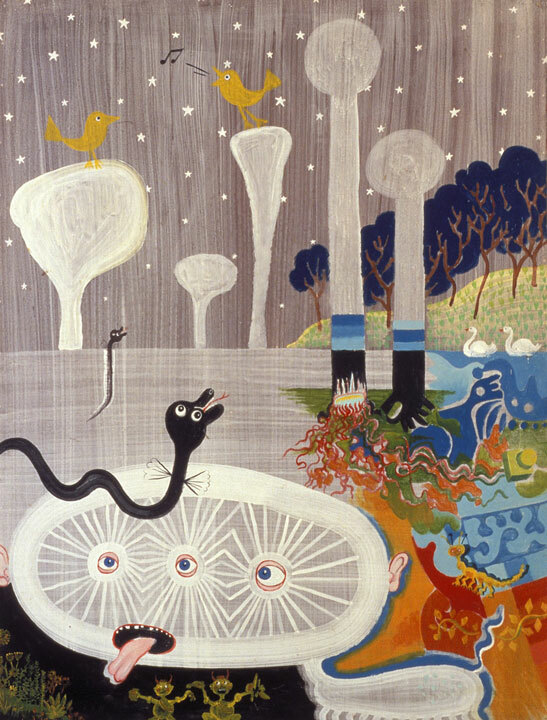 We talked about the practice of collage in relation to the development of Modern Australian Art . 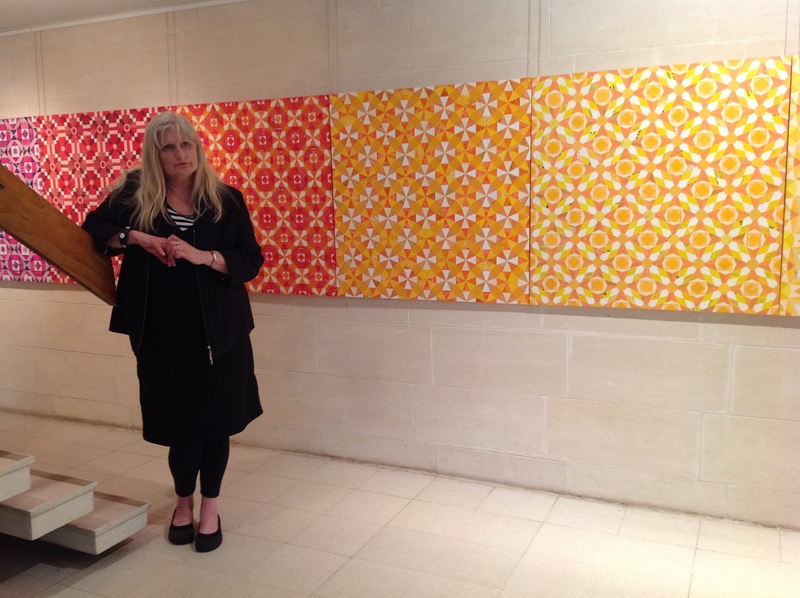 Next we were fortunate enough to have Elizabeth Gower discuss her work ‘Prismatic’ an incredible nine panel collage that wraps around the wall from the lounge room to the kitchen in Heide I. The intricately cut collages create a layer of ordered pattern from found materials such as packaging and advertising materials. 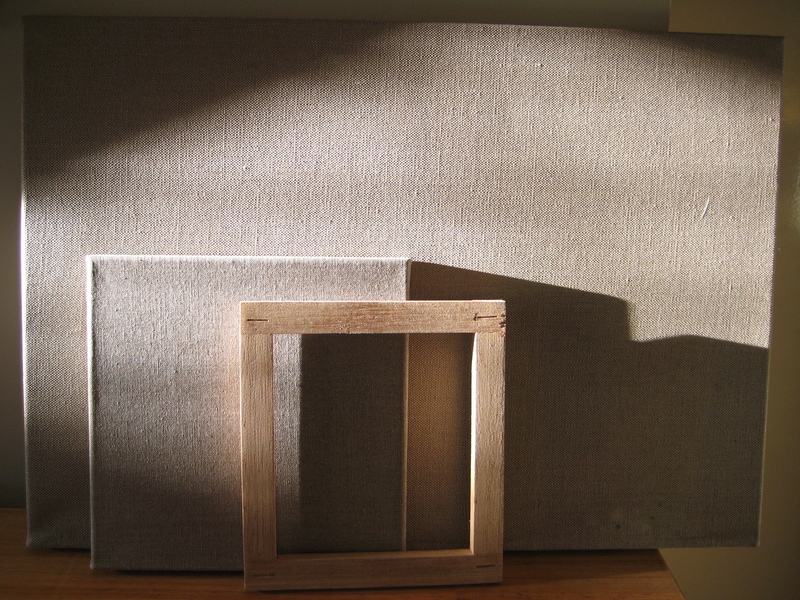 Elizabeth has created subtle colour gradations from panel to panel to form a rainbow-like effect . 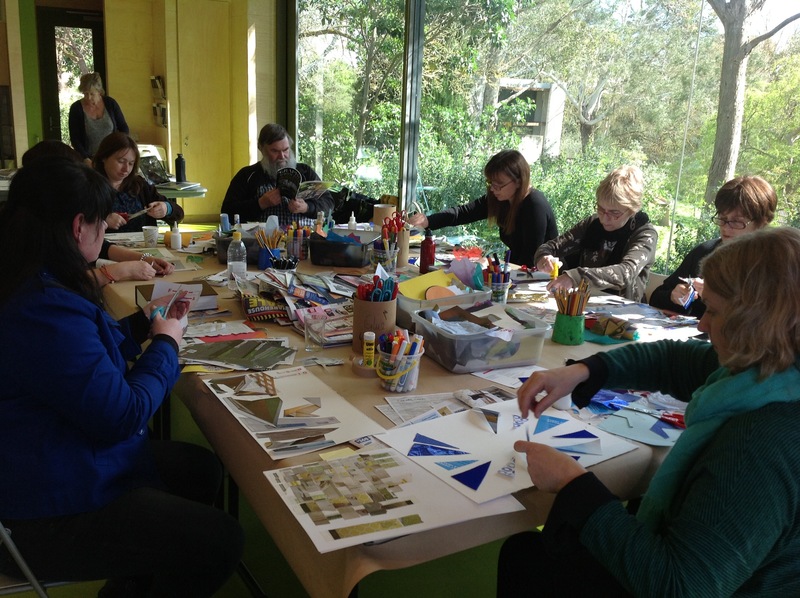 The group was fascinated by Elizabeth’s working methods as she described how she has been collecting paper for decades and collates these into colour groups in her studio to use for the creation of her collages. 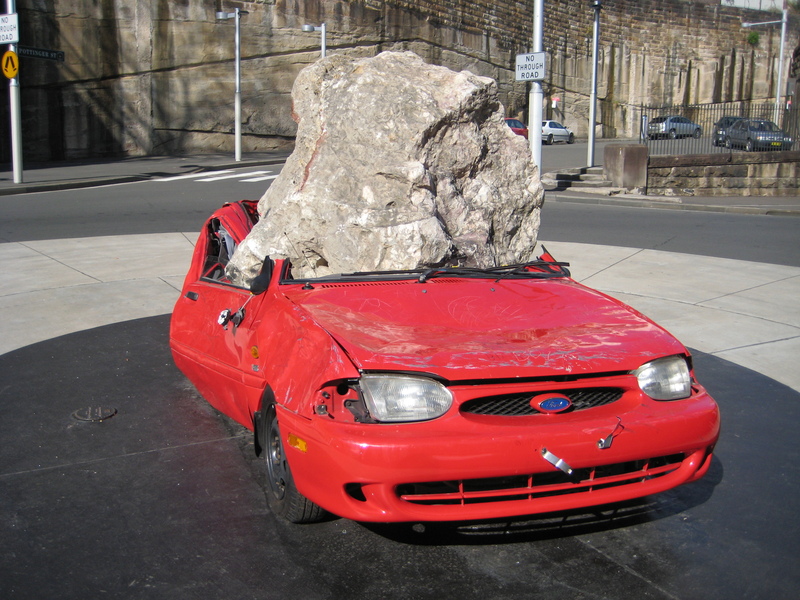 Nick Selenitsch also engaged the group, in a conversation about contemporary art practice and how he uses collage within his own practice and as an educator. Nick incorporates sporting motifs and iconography to form intricate patterns and designs in his mixed media collages and paintings. I facilitated a Visual Thinking Strategies (VTS) session with the group looking at MB’s ‘Lullaby in the Twilight Zone’. 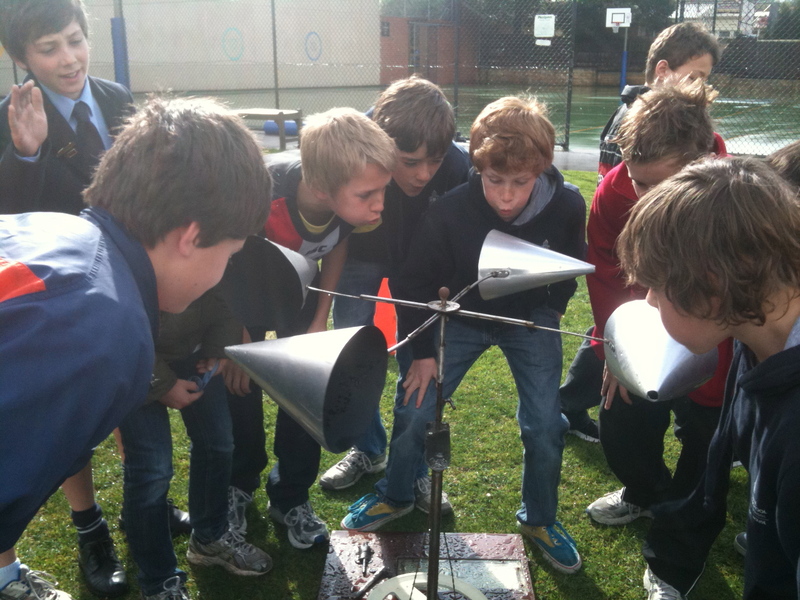 VTS is an enquiry based learning activity that encourages critical thinking. I have found it creates wonderful rich discussions around artworks where the group constructs an understanding of the artwork. What do you see that makes you say that? asks viewers to find the visual evidence in the artwork and draws the group into closer observations and deeper discussions. After lunch it was time to do some making! 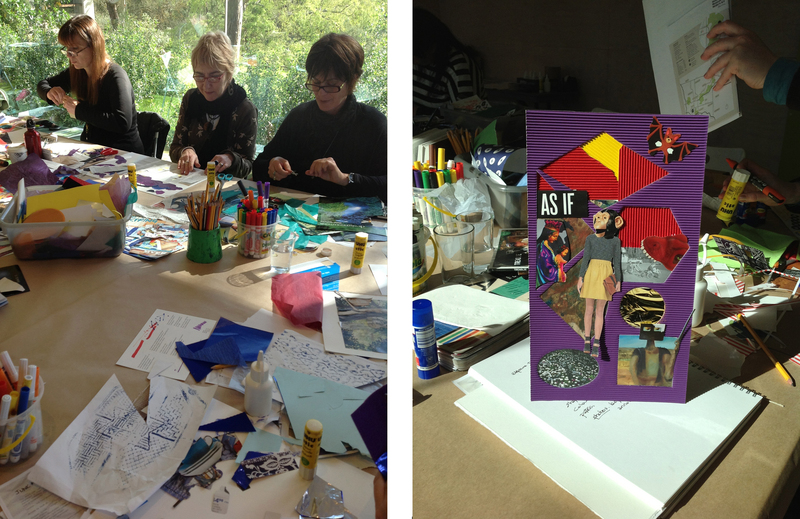 I ran a workshop for our group of educators reflecting on all of the collages we had been inspired by at Heide. I introduced some collage artists that I have found students to be especially excited by and shared some lesson plans for different age groups. One of which I have attached here. 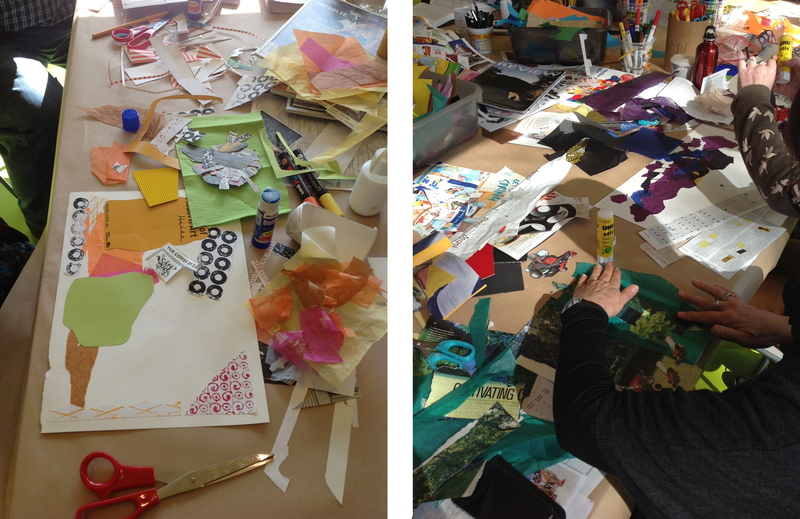 JUNK MAIL collages is a great project that can be adapted to suit all ages. The materials are simple – collect some junk mail from your letterbox for a week – the best stuff is the supermarkets cheap advertising materials. 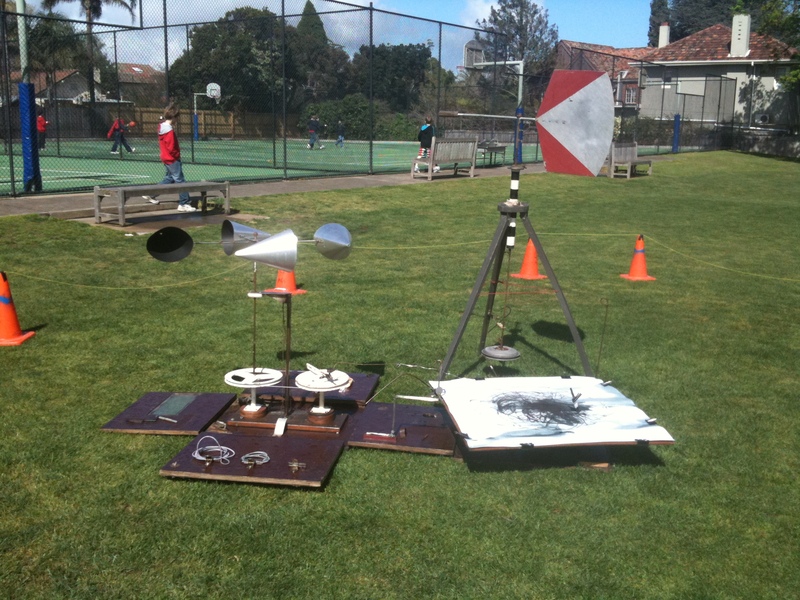 The project can work as a starting point for a Visual Arts unit or could be incorporated into another explorations, such as Sustainability. I have found that the nature of making a collage is really freeing for students. 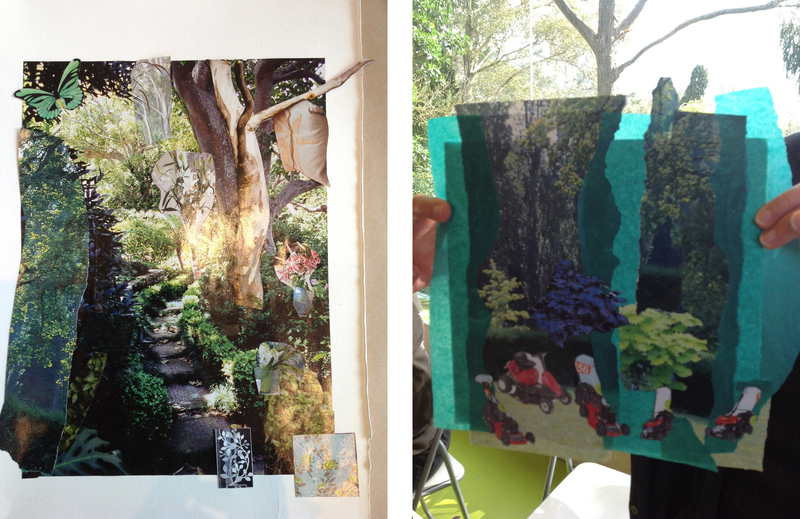 For senior students who are working independently, a collage lesson can be really useful. It might be that they need an idea to get started on for their folio or are feeling stuck with a folio that they have been working on for awhile. Tags: collage, exhibitions, heide MoMA, teaching, VTS | Permalink. 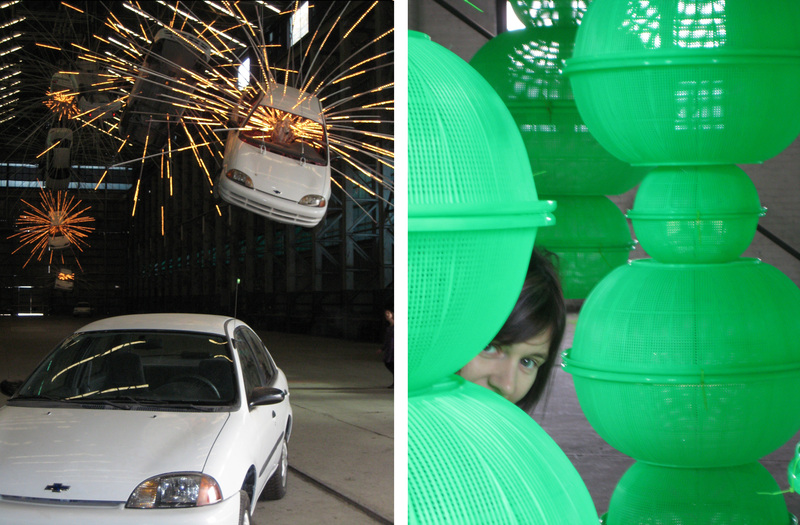 In 2008 and 2010 I was fortunate enough to take groups of VCE Art and Studio Arts students to the Sydney Biennale. 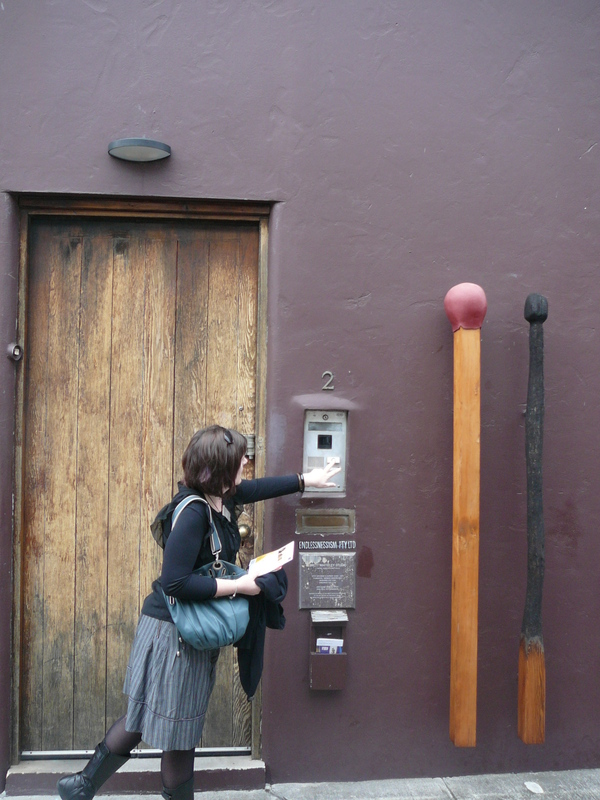 Both years we spent a week in Sydney exploring the Biennale sites and also visiting Brett Whiteley’s studio in Surrey Hills. 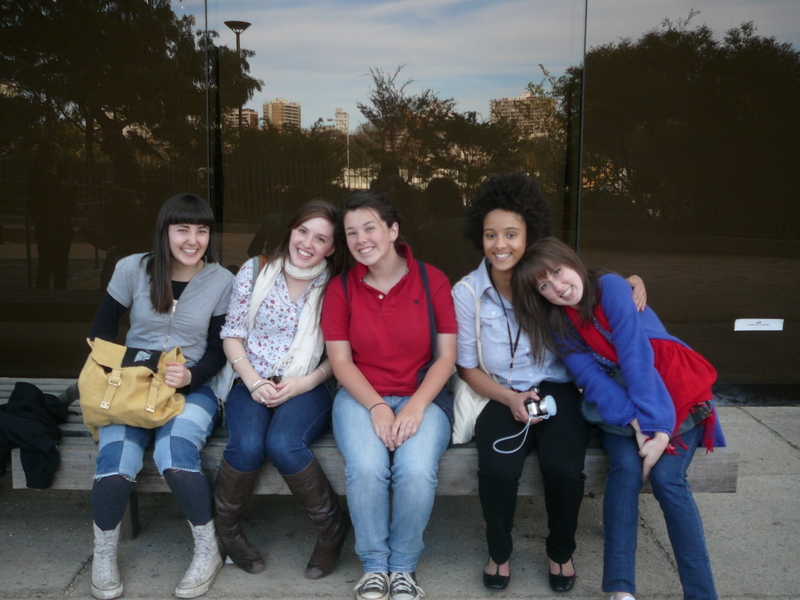 This program gave me a chance to immerse students in contemporary art culture and the effect on their folios when they returned to school was incredible. 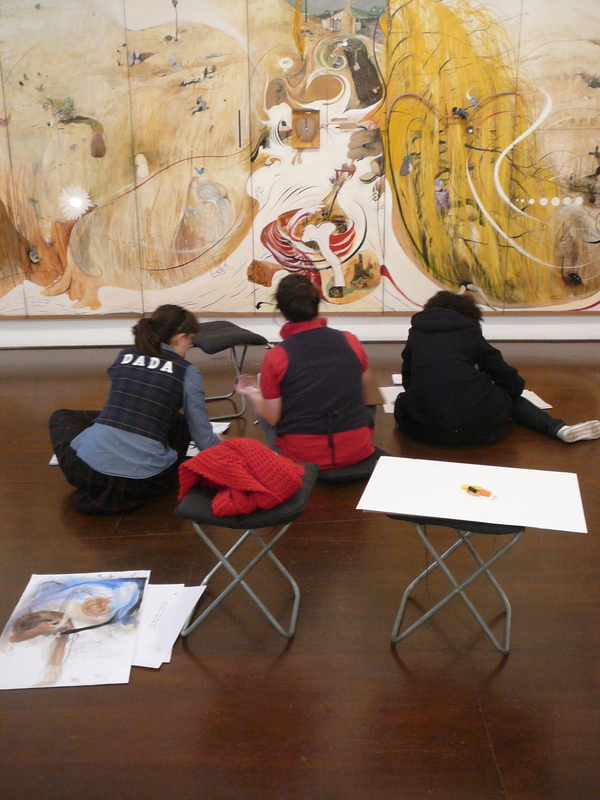 Not only this but the student’s found their dialogue for engaging with artworks became much more fluent and articulate. 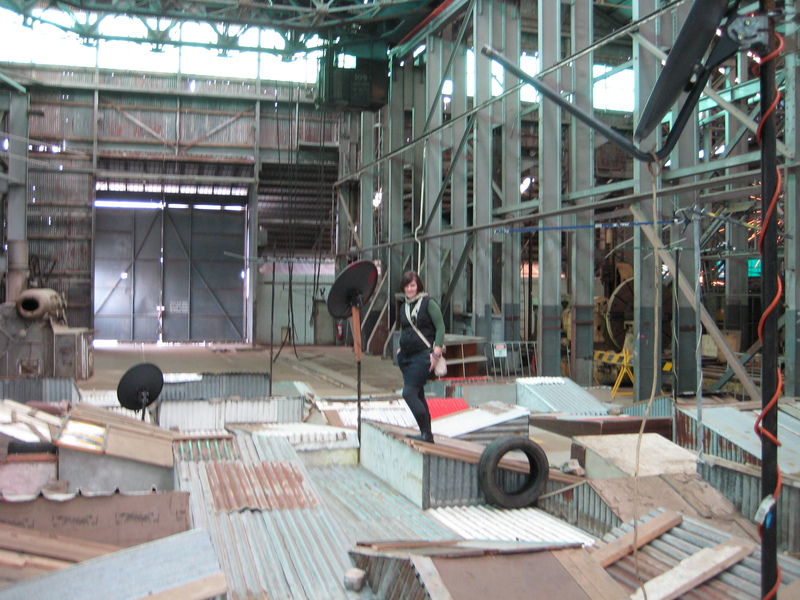 I had some wonderful art conversations with my students on these two trips and when visiting the 2012 Biennale I really missed them. Running this program was one of the experiences that started me thinking about working in Museum Education as a career. 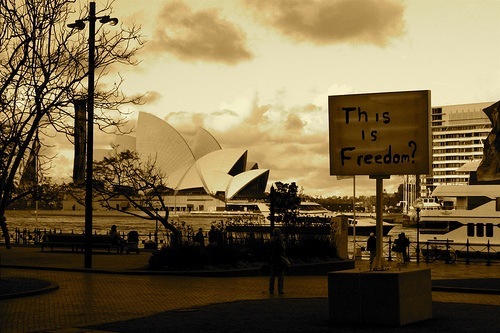 Heading in to see Pierre Huyghe’s forest in the Sydney Opera House. 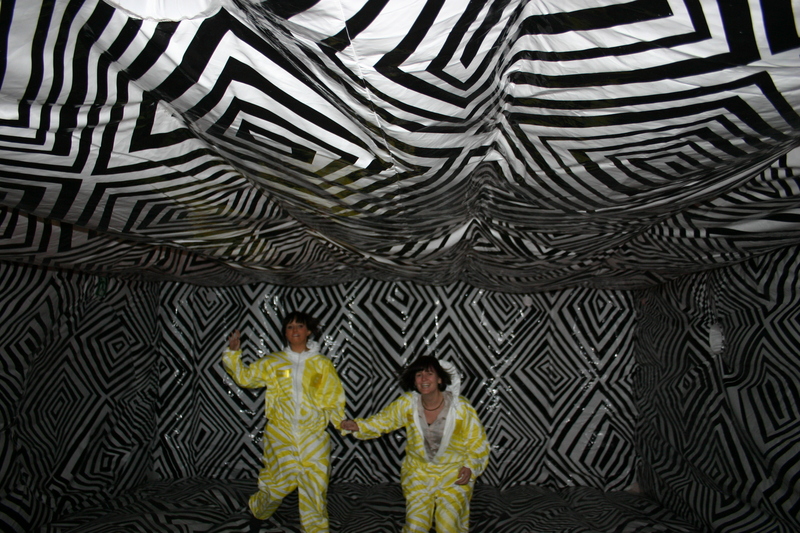 Tags: biennale, exhibitions, teaching | Permalink. 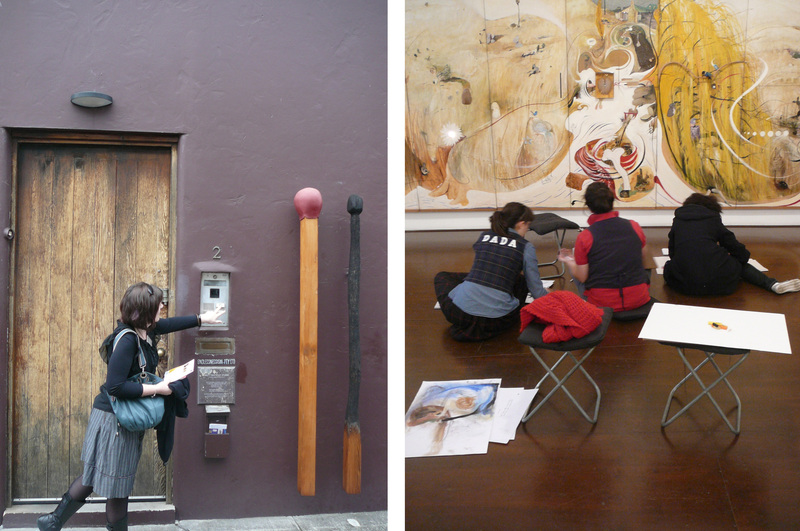 Earlier this year I began teaching at Box Hill Community Art Centre. I have been teaching an adult painting class as well a couple of youth art classes and I have met some gorgeous students so far. bhcac is a just such a beautiful place to work, it is a purpose built arts centre surrounded by community gardens and when I arrive there I instantly feel inspired. 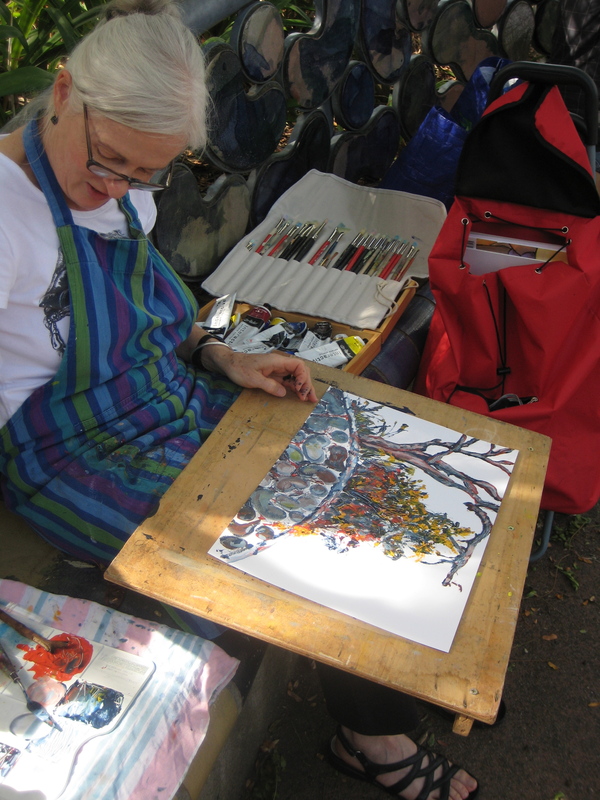 I teach in some beautiful studios that are brightly lit by the high ceiling windows (wonderful for natural light) and my painting class last term had a couple of sessions outside using the gardens inspiration. There is also a central gallery that exhibits some of the artworks from City of Whitehorse’s impressive collection and at the moment has an exhibition of some of my students’ artworks. 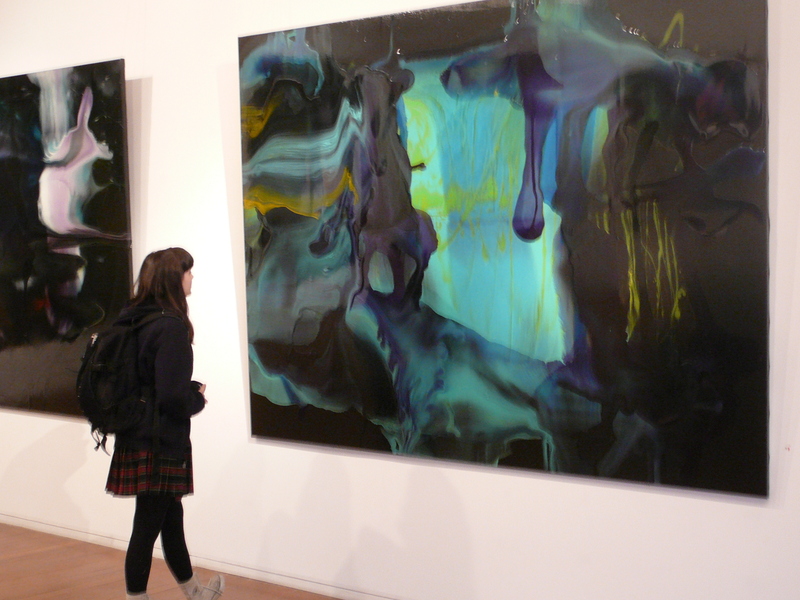 I worked with a group of young artists over two months, taking their ideas and creating artworks for exhibition. 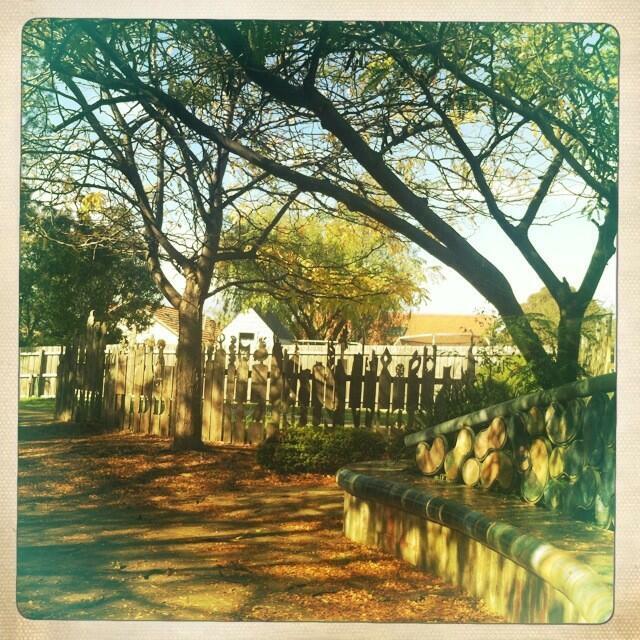 Tags: box hill community art centre, inspiration, teaching | Permalink. about teaching I wrote one day when I was supervising a class at a secondary school. I work as a casual relief teacher (CRT) for an income and also to stay in touch with schools. 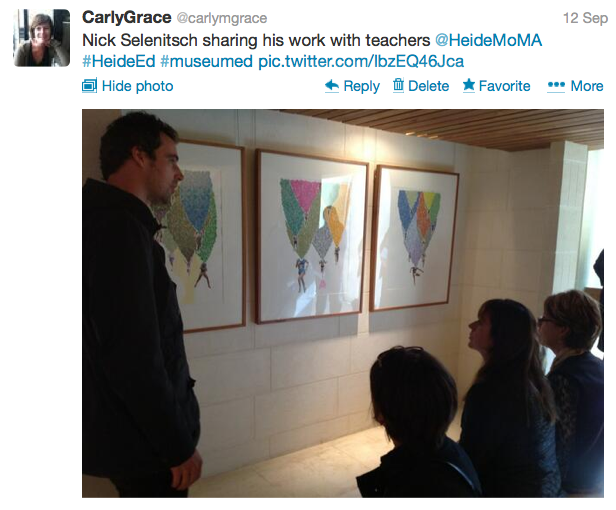 I really loved my job teaching art in the classroom and found it incredibly rewarding. 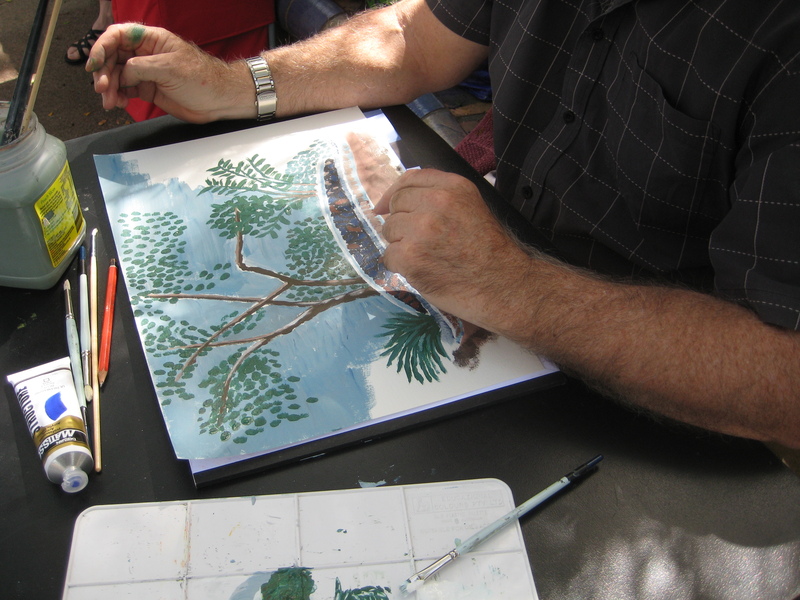 Especially when I had taught students in their younger years and they chose art electives and art VCE subjects as they moved up the school – continuity with students is the part I miss the most about ongoing teaching at a school. but! I never imagined CRT could be so fulfilling and I have had some spectacular times over the last year. visiting art rooms is endlessly inspiring, so many wonderful art things going on and crazy creative art teachers working in schools across Melbourne. 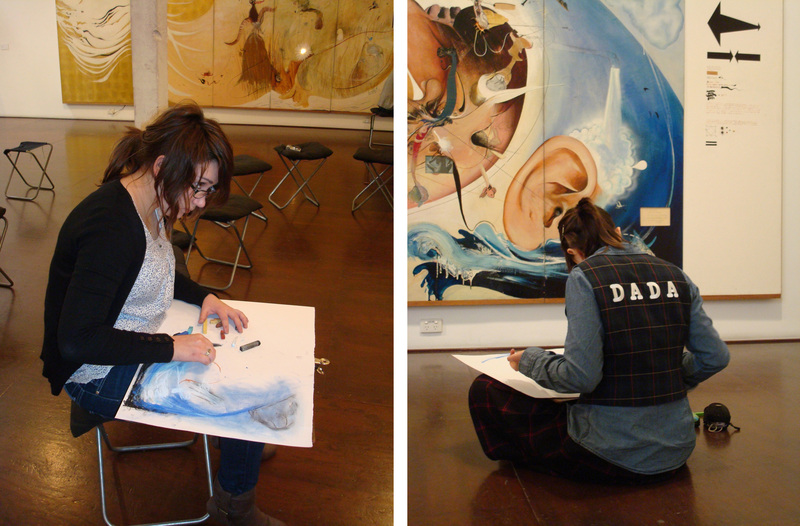 I am able to meet diverse groups of art students and often to return to teach them again and again. i love when the note says ‘so and so wasn’t expecting to be away so you can teach what you like’ !!! even though at times I have only had minutes to prepare this is the best opportunity to create a fun engaging art sessions. CRT has also given me lots of experience in primary art rooms, coming from a secondary teaching background, I have really relished my days at Primary Schools and even though I leave feeling absolutely exhausted (and definitely don’t have time to be writing blog notes when I’m at a PS) working with super inspiring little people is sensational. 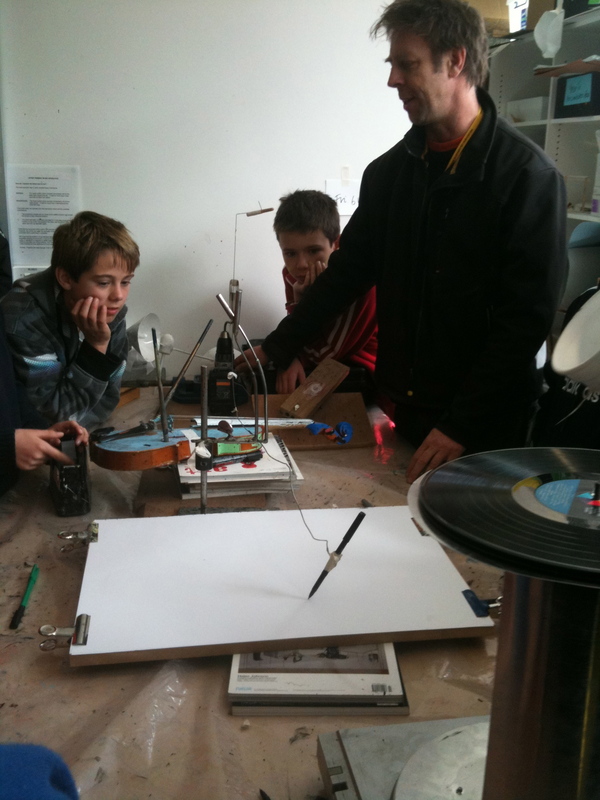 Tags: artists, inspiration, teaching | Permalink. 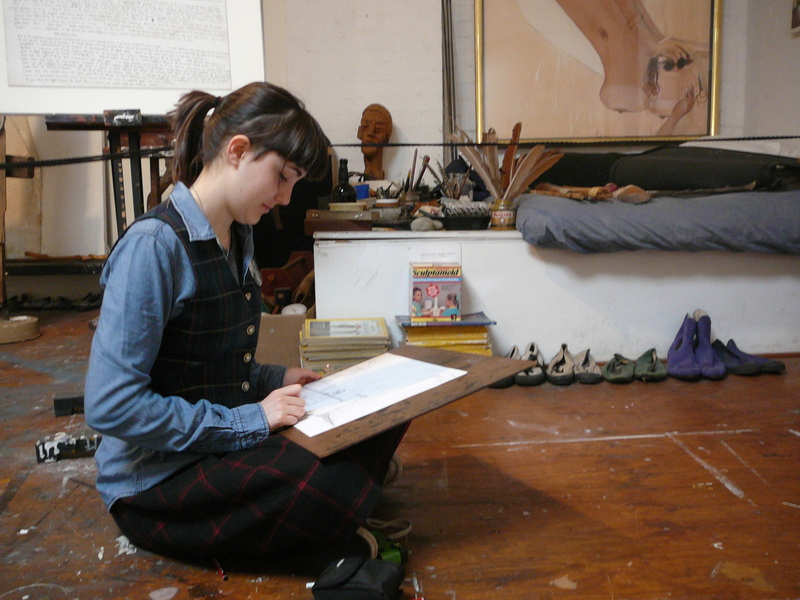 My name is Carly and I am an art educator and artist, living and working in Melbourne. 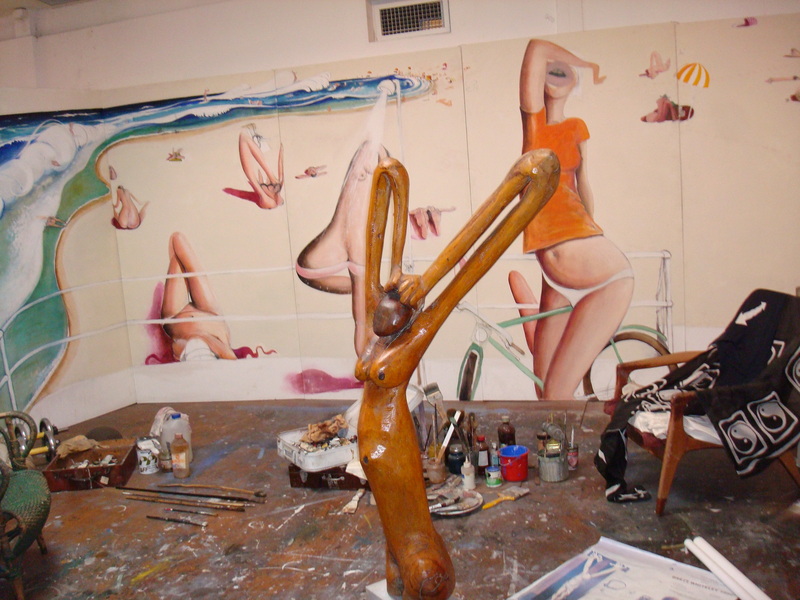 I love to create art, talk about art, look at art and show others how to make art a part of their lives. Over the past year I have moved from working full time in a secondary school teaching art to a new ‘life style’… I work as a casual relief teacher in Primary and Secondary schools. 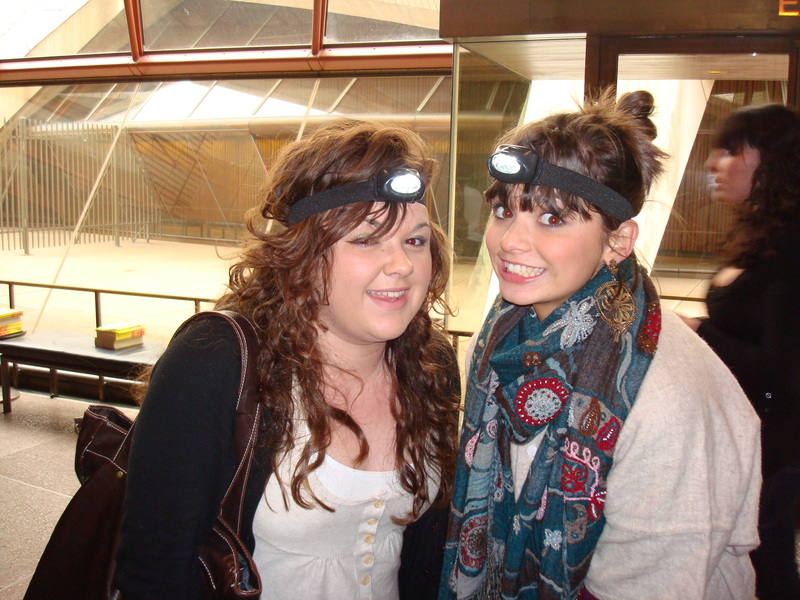 I am studying a Master of Cultural Heritage (Museum Studies) at Deakin University semi full-time. I volunteer at Art museums and galleries facilitating education and public programs. Currently I am working at Deakin University Art Gallery and Collections creating some education resources for their sculpture collection. AND I try to do as much art making as possible – sometimes for an exhibition, sometimes for teaching and sometimes just because…love. I have called this blog art on tuesdays because when I use to work full time(ish), tuesdays were my studio art making days. I really enjoyed having one day a week dedicated to my own art and I miss it now things are a little more all over the place. 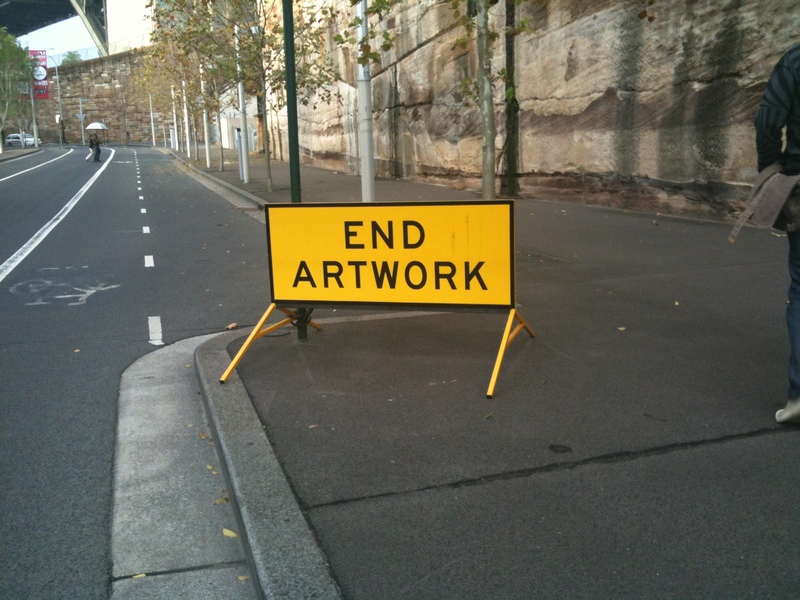 Maybe I will try to add some art or art thoughts here each Tuesday?